Be AWARE, ACT FAST, CALL 911. Use F-A-S-T to remember the warning signs and to act fast. FACE: Look for an uneven smile. ARM: Check if one arm is weak. SPEECH: listen for slurred speech. TIME: Call 911 at the first sign. Do not ignore the warning signs of a stroke. If you or someone you know is experiencing any of the above symptoms, ACT FAST, call 911 to get to the emergency hospital as quickly as possible. Get to the hospital within 3 hours of ONSET of symptoms. The affected stroke patient needs to be seen so that FAST TREATMENT may begin and stop an ischemic stroke in progress and reduce disability. You must seek emergency treatment right away. A Stroke occurs when the flow of oxygenated blood to the brain is suddenly interrupted. There are two types of Stroke: 1) Ischemic Stroke which is caused by the buildup of fatty deposits (plaque) in a brain artery, or by a blood clot which blocks blood flow in a brain artery; or 2) Hemorrhagic Stroke which is caused by a sudden rupture of an artery leading to the brain. When blood flow ceases to the brain, the brain receives no oxygen and nerve cells don’t function and die within minutes. When nerve cells don’t function, the part of the body they control can’t function either. This can cause temporary or permanent brain damage, and with time, can result in death because dead brain cells can NOT be replaced. TIA, or transient ischemic (TRAN-see-ynt is-KE-mik) attack is a ‘Mini Stroke” that occurs when a blood clot blocks an artery for a short time. The symptoms of a TIA are the same as those of a stroke, but they usually last only a few minutes. About 15 percent of strokes are preceded by a TIA. Don’t ignore a TIA. Call 911 or seek medical emergency medical attention immediately. What Are the Warning Signs and Symptoms of a Stroke? A Stroke can cause several different symptoms. Do not ignore them… every second counts. Stroke, treated early, can increase your chance of survival and diminish the likelihood of permanent brain damage. How Can I Learn More About Stroke? Talk to your doctor, nurse or other healthcare provider. How is a Stroke Detected? 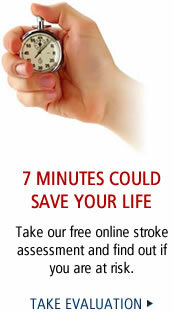 A Stroke is usually detected too late… that is, when a patient reaches the emergency room. However, if you experience early symptoms of a Stroke, there are imaging tests that can determine if you are having a Stroke or need treatment to prevent one. Stroke is a progressive disease caused by several cardiovascular risk factors. These include family history of Stroke, old age, diabetes, smoking, high blood pressure, high cholesterol, overweight, lack of exercise, and stress. We invite you to take a simple, free risk assessment to evaluate your own risk factors. What Are the Treatment Options for a Stroke? The best medicine for treatment of Stroke is prevention. This means making lifestyle changes to reduce your cardiovascular risk factors. A Stroke occurs when fatty deposits (plaque) build up inside the arteries leading to your brain. This is called peripheral vascular disease, and is progressive–meaning the plaque accumulates over time. But if you modify your risk factors that contribute to peripheral vascular disease (and coronary artery disease as well), you can maintain, and in some cases, reverse the effects of the disease. Should you or someone you know have a Stroke, a treatment plan will be developed specific to the severity of your condition. Your doctor will monitor your health carefully to prevent further brain damage. Then your doctor may recommend therapy to deal with consequences of Stroke. This may include physical, speech and occupational therapy.